This course is intended for students to become proficient in algebra, in order to build a firm foundation in preparation for MTH 111 Precalculus. Problem solving and applications will be emphasized throughout. MTH 111 requires a C- or better in MTH 101. LEC: (3 crs.) Introduction to algebraic manipulation, solving equations and Inequalities in one variable. Plotting points and graphing elementary functions. Interpreting and expressing mathematics. Intended for STEM majors who are not prepared to take MTH 111. (Lec.3) Pre: S in MTH099. Not for credit for mathematics majors, not for general education credit, and not open to students with a C- or better in MTH131 or MTH141. Solve relevant applications (exponents, quadratic equations, rational expressions). Students are expected to be active participants in this course. This includes attending class regularly and completing any/all assignments. See your sections Sakai page for details on class assignments. Homework will be completed online through MyMathLab. There will be 3 night exams. Absolutely no calculators are allowed on any exams. There will be a cumulative final at the end of the semester covering ALL material learned in class throughout the semester. To calculate your grade, take your cumulative points and divide by 660. Assignments will not be graded on a curve nor will any extra credit be made available. MyMathLab is an online homework system that will be used for the homework assignments in this course. A MyMathLab registration code is required. 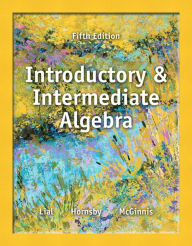 A registration code comes bundled with each new version of the textbook sold at the bookstore, or can be purchased separately if you want to use a used textbook. MyMathLab also comes with an electronic version of the textbook. MyMathLab assignments will be constant over all sections of the course. You are responsible for getting MyMathLab set up and enrolling in the online section of your course in a timely fashion. See MyMathLab Sign Up Instructions. You have unlimited attempts for each question, but the numbers will reset after three incorrect attempts. If you are unsuccessful after all three attempts, you may click "Similar Problem" to try again. This process can be repeated until you are successful. Late homework will receive half credit. Attendance is a vital and necessary part of this course. While there is no formal attendance policy, we cover a lot of information at a rapid pace; missing a class will result in a large amount of material missed. Students are responsible for all missed work, regardless of the reason for absence. It is also the absentees responsibility to get all missing notes or materials. You are expected to attend every lecture, and to submit your work on time. Late homework will recieve half credit. It is your responsibility to communicate clearly when writing up solutions for assignments, quizzes, or exams. Your results must display your understanding well and be written in a correct, complete, coherent, and well organized fashion. The rules of language still apply in mathematics, and they apply even when symbols are used in formulas, equations, etc. The rapid pace of the class requires that you spend time every day doing homework, reviewing notes, reading the textbook, and working out extra problems, all in addition to the time spent in class. Makeup exams may be scheduled in the event you are unable to attend exams under the following conditions (A-B). In particular, if you must miss the exam because of a scheduling conflict, you must notify your instructor before, not after, the exam, and emergencies require you to contact your instructor within 24 hours. See University Manual sections 8.51.10 and 8.51.14 for guidelines. A: If your reason for missing the exam as scheduled is (i) a University sanctioned event for which verifiable documentation can be provided (including another scheduled class), (ii) a responsibility to an employer that cannot be rescheduled (with documentation from your employer), or (iii) Religious holidays, then you MUST INFORM YOUR INSTRUCTOR 48 HOURS IN ADVANCE OF THE EXAM AND PROVIDE DOCUMENTATION IF REQUESTED. Makeup exams will be scheduled after the actual exam, and preferably before the class period when exams are to be handed back, but no later than one week after the original date. B: If the reason for missing the exam as scheduled is due to (i) illness (with verifiable documentation from a medical provider), or (ii) an emergency (with appropriate documentation), then you MUST INFORM YOUR INSTRUCTOR WITHIN 24 HOURS OF THE EXAM and provide documentation upon your return. Failure to notify your instructor within 24 hours will result in a 0 for the exam. No exceptions. Makeup exams may be scheduled no later than a week after the original date, unless the illness or emergency precludes this, in which case the makeup exam will be given on a common date during the last two weeks of the semester. Students that miss course work (not exams) under the same the conditions mentioned above will be given the opportunity to make up the course work. Cell phones, ipads, ipods, etc. should be turned off during class. Excepted from this are electronic pads used for note-taking. Your instructor may tell you about other exceptions. Texting is NOT allowed. Absolutely no calculators are permitted on exams. All class materials (e.g. notes, projects, exams, lectures, etc.) are property of URI and the instructor. Copying, video taping, taking pictures, or posting this material is not allowed without consent of the instructor and URI. Please come to class prepared by reading over the text to be covered and by bringing your book, notebook and pencil. You are here to learn, so give class your full attention, ask questions if you do not understand, and be respectful and courteous to your fellow students and professor. There is no alternative credit in this course. Don't ask. Cheating is defined in the University Manual section 8.27.10 as the claiming of credit for work not done independently without giving credit for aid received, or any unauthorized communication during examinations. Students are expected to be honest in all academic work. The resolution of any charge of cheating or plagiarism will follow the guideline set forth in the University Manual 8.27.10-8.27.21, http://web.uri.edu/manual/chapter-8/chapter-8-2/. Any student with a documented disability should contact your instructor early in the semester so that he or she may work out reasonable accommodations with you to support your success in this course. Students should also contact Disability Services for Students: Office of Student Life, 330 Memorial Union, 874-2098. They will determine with you what accommodations are necessary and appropriate. All information and documentation is confidential. There is help available from the Academic Enhancement Center (AEC). The AEC offers tutoring (both walk-in and appointment-based types) and academic coaching. For more information on AEC services and study tips, visit the AEC website at http://web.uri.edu/aec/. University of Rhode Island regulations concerning incomplete grades will be followed. See University Manual sections 8.53.20 and 8.53.21 for details. It is the policy of the University of Rhode Island to accord students, on an individual basis, the opportunity to observe their traditional religious holidays. Students desiring to observe a holiday of special importance must provide written notification to each instructor. Students are responsible for being familiar with and adhering to the published Community Standards of Behavior: University Policies and Regulations which can be accessed in the University Student Handbook (www.web.uri.edu/studentconduct/university-student-handbook/). If you must come in late, please do not disrupt the class. Please turn off all cell phones or any electronic devices.